Greetings adventurers! We're doing something a little bit different with this update and wanted to show off some of what Josh has been sharing on his Instagram and Twitter feeds. So join Katrina as she shares with you some awesome new Pillars of Eternity II: Deadfire footage! The team is pushing forward with some sweet E3 content at the moment, but we'll be back after E3 to share with you an epic new video! 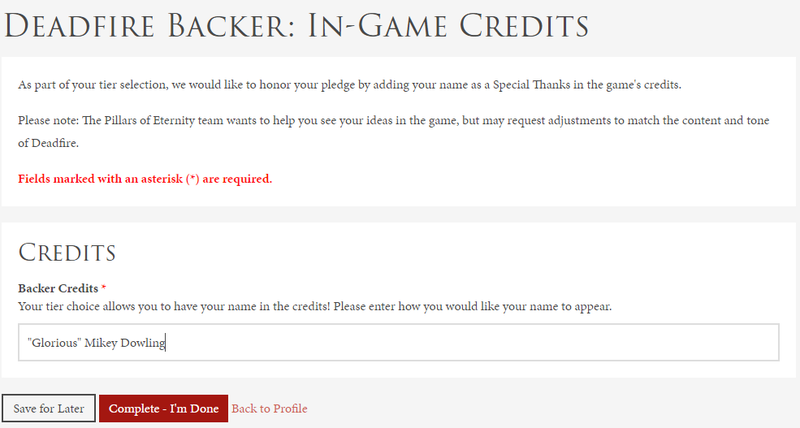 For those who are at the $99 tier and above, you are now able to fill out your Backer Survey. If you go to the Eternity Backer Portal you'll notice that you have a message up near your login name at the top right of the screen. Click on "Finish Incomplete Survey!" and you will be taken to the Surveys Tab of your Account Profile. Click on the survey that you need to fill out and fill in the required information. As Katrina said in the video above, if you were in the higher reward tiers, emails will be sent out to you personally, so be on the look out! Also, if you liked this video and want to see more like it, let us know below and we'll gladly make more. Yo what gives? Katrina didn't scream about shooting someone in the cooter even one time in this video. I demand to know who this doppelganger in the video is, and what have you done with the real Kat? Also of course... Awww Yiss... Ducks. EDIT: And on a more serious note.... so how easy is it to mod that boring wood bottom bar this time :D? Edited by Karkarov, 02 June 2017 - 04:03 PM. Love the new tooltips and improved combat log, will spend many hours staring at them. Cool stuff all around. Plenty of really nice additions here. Hopefully the walkpathing revamp is a big improvement.